Continuing our series on the Future of Work, Katie McCrory explores the benefits and the challenges of non-traditional organisational structures. What was the first decision you made at work today? 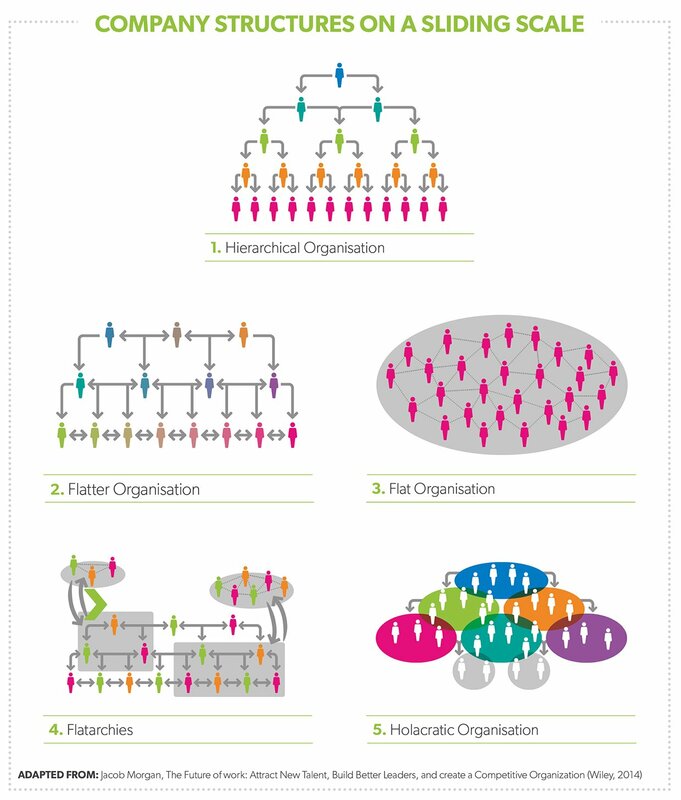 For people who work at a ‘holacracy’ it was where to sit. They also chose what to work on, how much their colleagues should be paid, and where they might all go on the next company holiday. Makes deciding what to have for lunch feel pretty inconsequential, doesn’t it? In this series we’ve explored the ways in which businesses are being disrupted by new leadership models, the rise of technology, and a multi-generational workforce, so perhaps its inevitable that many of the organisations adopting these progressive advancements might take them to their natural conclusion: no management. If your first instinct, when your boss goes on holiday, is to kick back, put your feet up and clock-off at lunchtime, then working within a flat organisation possibly isn’t for you. Holacracies, flatarchies and flat organisations require one key component if they are going to work, and that’s trust. Trust that you’ll get the work done, trust that you’ll do what’s needed, trust that you’ll be fair. Distributing authority from the one to the many makes the criteria for business success a part of everyone’s role, not just those with the right kind of job title. And that places enormous emphasis on the recruitment process which must ensure that people who join the organisation take that responsibility on board. There’s a lovely (although probably apocryphal) story about the time President John F Kennedy visited NASA to get an update on his audacious goal of getting mankind intergalactic. After meeting with the engineers, the astronauts in training and the scientists breaking new ground every day, he bumped into a cleaner as he was leaving the building. On asking him what his job was, the cleaner replied ‘Sir, it’s my job to help put a man on the moon’. It makes a superb point that flattening structures isn’t just about tearing up the organisational chart – it’s about communicating with everyone and allowing every single member of staff to feel like they play an integral part of the vision and mission of the company. Done right, and the benefits can be plentiful. The very nature of a flat structure mirrors the broader sharing economy, which allows for flexible working, job-shares and other progressive employment opportunities which recognise that workers have full lives and commitments outside of the office. More fluidity amongst the staff means that expertise can be more readily shared, creativity and problem-solving take on greater premium, and businesses can flex more easily according to market pressures and customer demands. But it’s certainly not for the feint-hearted. The inherent contradiction is that loser, flatter organisations still need a tight handle on how decisions are made so that ‘group-think’ doesn’t hamper the pace needed to drive growth. There are pros and cons to be considered, and for many the traditional ‘command-and-control’ approach to leadership still gets the fundamentals right, particularly for global multinationals dealing with complex workforces and multiple market cultures. Ultimately, it takes us back to that motivating vision of putting a man on the moon. Because we can talk about ‘operational alignment’ and ‘engagement paradigms’ and ‘conscious workforces’ all we like, but in truth it all comes down to something profoundly simple: we can achieve extraordinary things when everyone is given a part to play. To read more about these issues, check out the B Team's New Ways of Working report.